How can we reach and impact the next generation of explorers? How can we make them care about science, engineering, and technology? How can we prepare them to work for NASA? What if we built a cute, smart rover that they can talk with? If we built it, would they engage? As it turns out, the Jet Propulsion Lab (JPL) actually did build one…and ROV-E is her name-o. The Remotely Operated Vehicle for Education (ROV-E) was built over the course of about a year by six Early Career Hires at JPL as a way to learn the end-to-end process for building a spacecraft. 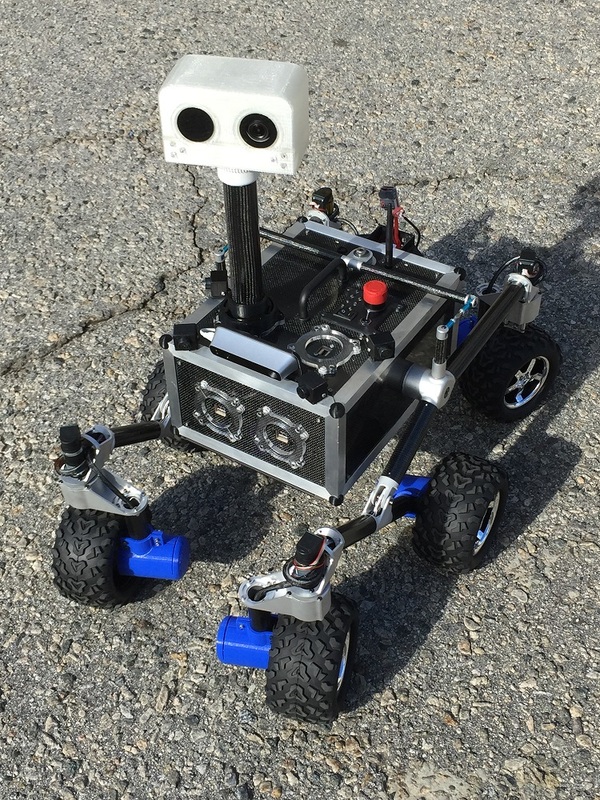 They designed and built ROV-E to go to schools and museums, drive over people as they lay on the floor, and have expandable USB ports so that future engineers and dreamers can give her new features. This year, we used these USB ports to give ROV-E a voice through the power of Amazon’s Alexa and Amazon Lex. We demonstrated ROV-E’s new features at Amazon’s re:Invent conference in December 2016. ROV-E, looking a bit like the Curiosity rover, strutted her stuff in front of several thousand people and they marveled over her prowess and agility. She drove and answered questions about Mars. She is built mostly from open source software and hardware components, as well as 3-D printed parts. She can take driving commands both from voice commands and an optional remote control. She can automatically follow you around using a camera and a 3-D depth sensor. She can avoid obstacles and even has a blinker to tell us where she’s going. She can do this through a constant Internet connection. The grand finale of ROV-E’s demo happened when we turned off the Internet on stage–and ROV-E kept going. This feat constituted the worldwide launch of a new technology called Greengrass, developed by Amazon and JPL. Greengrass, which Amazon launched at the re:Invent conference, allows Lambda and Internet of Things functions to work without Internet. Once Internet is available, the devices reconnect, continue to stream data, and update themselves. This type of technology could be really important to NASA in offline situations such as sending rovers under vast sheets of ice or automatically guiding rovers to help find and rescue stranded miners. So, did people engage? Yes, they did. ROV-E was the star of the show, with people even asking to take selfies with her. She has also performed at the NASA Booth at the Consumer Electronics Show and has gone to numerous outreach events. We have since released the logic for ROV-E’s voice to the public through a custom Alexa skill called “NASA Mars,” where anyone can get answers to thousands of questions about Mars as well as get the latest updates on what the real Curiosity rover is up to on Mars. We’ve decided to take the next step and make ROV-E available to the world through inexpensive open source components and a simple instruction manual so that anyone can build one at home or at school. We want to make it cheaper and easier to build than it currently is. We also want to make it into a science platform where citizen scientists of all ages will be able to add their own hardware and program their own experiments. By the end of this summer, ROV-E will come to explorers and tinkerers of all ages and to a school or museum near you. We hope that ROV-E will be a Robotic Ambassador that will make NASA proud and inspire everyone to participate in NASA’s mission.